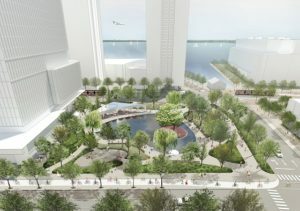 An artist rendering of Love Park by Claude Cormier et Associés. Love Park by Claude Cormier et Associés has been selected for York Street Park, and Rees Ridge by wHY Architecture and Brook Mcllroy for Rees Street Park. An artist rendering of Rees Ridge by wHY Architecture and Brook McIlroy. The jury appreciated the simple and timeless nature of the Love Park design and said its natural elements and elegant forms created a contemporary and inviting space for visitors. The classic approach to this design, with a central water feature and lush perimeter, makes it appealing for both winter and summer uses. It also creates opportunities to exhibit public art throughout the space. The Rees Ridge was also unanimously selected as the winning submission for Rees Street Park. 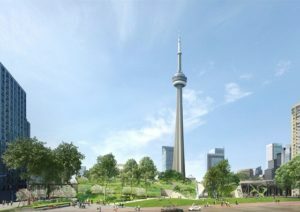 The jury was impressed with its bold and thoughtful design, which includes a large ridge that changes the relationship of the waterfront to the downtown. The multifunctional design allows for year-round activity and also creates many opportunities for flexible art integration. Construction of York Street Park is expected to commence in 2019 with a budget of approximately $7 million. Rees Street Park construction should behing in 2020 with a budget of approximately $10 million.